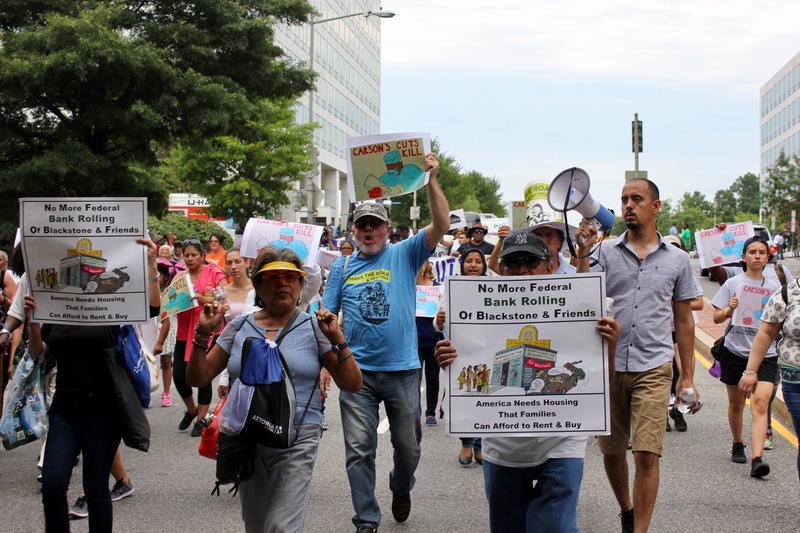 On Wednesday, July 12th, thousands of tenants from across the U.S. gathered in Washington, D.C. for a day of action protesting the proposed $7.4 billion funding cut to the U.S. Department of Housing and Urban Development (HUD). With their “Carson’s Cuts Kill” signs, the crowd chanted, “Fight, fight, fight, housing is a right!” as they gathered for a Town Hall to start the day. 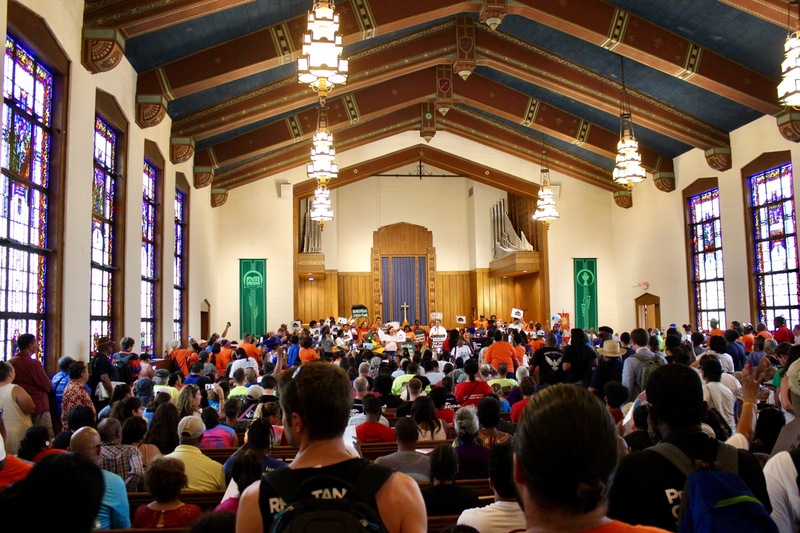 U.S. Senate and House Representatives – including Sen. Elizabeth Warren of Massachusetts and Rep. Nydia Velazquez and Rep. Adriano Espaillat of New York – spoke to the crowd, along with public housing residents, renters, and homeowners, who told stories of their own struggles against eviction. “Public housing is also part of our infrastructure. It's not just tunnels and bridges,” said Rep. Espaillat directly addressing the need for the funding, which if cut would eliminate housing vouchers for 250,000 households and increase rents for all federally assisted households from the current 30 percent of income to 35 percent, according to the research from Center on Budget and Policy Priorities as reported by U.S. News. “A safe, stable, affordable home is the foundation for almost everything else in our lives. Raising children, finding good work, building a real community…everyone deserves a decent place to call home,” said Sen. Warren. 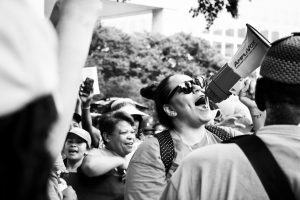 Tenants then gathered outside of Fannie Mae where they sang, danced, and cheered before marching to the HUD building where they staged a “die in” to illustrate the effect the proposed cutbacks would have on communities. 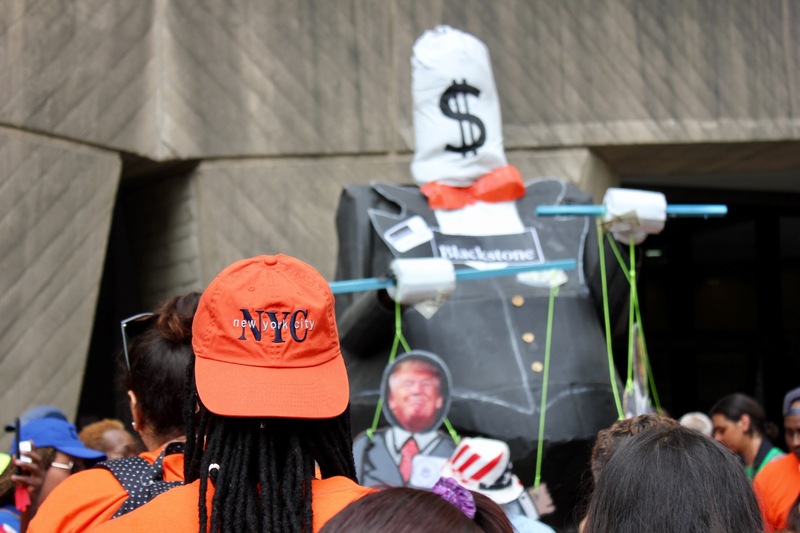 After that, tenants marched through the streets of D.C. passing cars honking in support to the home of a Blackstone lobbyist – Blackstone, the largest private equity fund in the world, has become America’s largest corporate landlord. Blackstone has recently developed a fund to target senior housing, including manufactured housing communities. Their CEO, Steven Schwatzman, chairs President Trump’s Business Advisory Council. The event was organized and sponsored by several organizations including New York Communities for Change, Community Voices Heard, Center for Popular Democracy, WE ACT for Environmental Justice, and others. ANHD and many of our member groups were there to participate and show our support including Banana Kelly Community Improvement Association, Community Action for Safe Apartments, and Make The Road New York. Secretary of HUD Dr. Ben Carson supports the proposed budget cuts, which would mean necessary aid to the most vulnerable people across the country will be lost. This march is just the beginning. We will not stand by as people are priced out of their homes and put out on the streets. We believe housing is a fundamental right regardless of income level, and we will continue to fight with our member groups and the broader housing movement to not only push back against these devastating HUD cuts, but to fully fund our communities’ housing needs.